It is one of the largest and most magnificent baroque castles in Europe: Schloss Bensberg. Once a year, it attracts not only prominent guests but also "very important cars" to Bergisch-Gladbach for a classic car rally. When racing legend Jacky Ickx is on the road in an old VW Beetle, German actress Sophie Wepper is posing in a 356 Speedster and her colleague Hardy Krüger, Jr., is driving with a 911 Carrera Cabriolet, vintage 1984, through Bergisches Land: then we know the time for the Schloss Bensberg Classics has come again. The sixth revival of the renowned classic car event celebrated the theme of "very important cars only." And that's what Porsche sent to the event, eight in number, to be exact. Among them were a 956, the legendary 550 Spyder and the 356 Abarth. Alongside the Rallye Historique, which took the participants over climbs and steep descents in the surroundings, and a special exhibition about Le Mans, the Concours d´Elégance also awaited the visitors as it does every year. Legends with a glorious tradition, precious unique specimens and extraordinary prototypes – amidst such treasures, the panel of judges grouped around Dr.-Ing. Franz-Josef Paefgen, the former Chairman and CEO of Bentley Motors and President of Bugatti Automobiles S.A.S., selected their favourites. The Special Prize went to the Maserati 150 GT Spyder. Yet Porsche, too, won over the judges: the 356 Pre-A Speedster, vintage 1955, was victorious in the category of "Heavenly Icons – Rare Convertibles (Postwar)," which the audience voted as the best vehicle of the event. 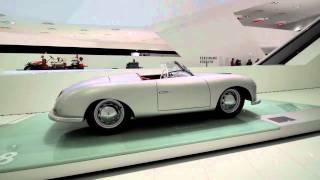 Porsche cars – both young and old – want to be driven. That is why the museum is once again going on tour in 2014. Classic cars are not only attractive exhibition objects; they are also there to be driven.